It’s hard to believe it’s been 10 years since Taylor Swift’s debut album was released. (Actually, I remember well the first time I heard it — played by my college roommate on repeat in our freshman year dorm — it just seems completely implausible that THAT was 10 years ago.) To commemorate that time — for Taylor, not me — Simon & Schuster is planning to publish a book about the pop superstar, according to Entertainment Weekly. Oddly, it’s the first major book to be released about her. Much like some of her album covers and Instagram account, the book about Swift will be a sort of scrapbook paying homage to the singer. The book is set to include fan art, concert photos and articles published about the singer over the years as well as the press release for her first album. Title contest: The book’s title will be determined by a contest. 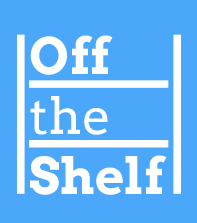 Fans are invited to submit the title they think the book should have, along with a brief essay of 250 words or less in support of their title, with the winning title to be chosen by Simon & Schuster. The fan who wins will receive a $2,500 payment and credit in the published book. This contest will run from Dec. 13, 2015, through Jan. 13, 2016, and entries may be made at www.SwiftFanBook.com. Honorary authorship contest: Although the book is a group effort, Simon & Schuster is looking for one super-Swiftie to serve as its honorary author and the face of the book to the public. That fan, whose name will appear on the cover and help select content for the book and promote it, will also be chosen via a contest. Fans who think they have the passion, knowledge, creativity, and charisma for the role can make their case in a video of three minutes or less to be uploaded at www.SwiftFanBook.com. The winner will be chosen by Simon & Schuster and receive a $10,000 payment. At the time of publication, the author will be flown to New York for a press tour, a book signing in Manhattan, potential appearances on major media outlets, and more. This contest will run from Dec. 13, 2015, through Jan. 13, 2016. Cover contest: Once the book’s title and author have been determined and announced, fans with a flair for graphic design can create the cover they think the book should have. The winning cover design may be used on the published book, with the designer to receive credit on the book jacket and a $5,000 payment. This contest will run from Feb. 1, 2016, through March 1, 2016, and submissions should be uploaded at www.SwiftFanBook.com. The book’s planned release is October 24, 2016 — brilliant, considering it’s just in time for next holiday season, and I imagine a lot of young teenage girls will want a copies for Christmas and Chanukkah. Because Lena Dunham wasn’t enough, another twenty-something actress is setting out on becoming an essayist. According to Page Six, this time it’s Anna Kendrick. The actress/singer is now adding author to her resume, with plans to write a book of autobiographical essays, due out in Fall 2016. Touchstone, an imprint of Simon & Schuster is publishing the book, which is said to include funny and embarrassing stories about the star. The book does not yet have a title. A little more back and forth about that Goldman Sachs Twitter feed turned book deal — the book is back on! Last week, I reported that after having gotten a book deal with Simon & Schuster imprint Touchstone, the Straight to Hell: True Tales of Deviance and Excess in the World of Investment Banking author had lost the deal since he never actually worked for Goldman Sachs. But according to The New York Times, author John LeFevre got a new publishing deal, this time with Grove Atlantic, an independent publishing house. Plans for the book remain virtually the same; the book will be based on the Twitter account @GSElevator, a parody account that includes dark, harsh, but funny tweets supposedly overheard in the elevators at Goldman Sachs, one of the biggest investment banking firms in the world. LeFevre, who until now had remained anonymous, received a six-figure advance from Grove Atlantic. Publishers promise the book will be strictly marketed as a work of fiction — again, because he never worked for Goldman Sachs. (He worked for Citigroup.) The book is due to be released in November. Sounds like it’s hard to say no to this wolf of Wall Street! Just as I was about to write this fabulous post about the seemingly funny and great book due out this fall, I learned that plans for it had been cancelled. According to Time, the book based on the parody Twitter account @GSElevator will no longer released. This comes after the publisher learned that the writer of the Twitter account never actually worked for Goldman Sachs, the company that the tweets are based on. 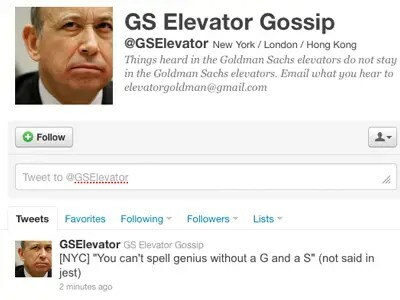 @GSElevator is a parody account that includes dark, harsh, but funny tweets supposedly overheard in the elevators at Goldman Sachs, one of the biggest investment banking firms in the world. The account has more than 600,000 followers. Entitled Straight to Hell: True Tales of Deviance and Excess in the World of Investment Banking, the book was expected to “go beyond” the “over-the-top behavior that has become associated with big Wall Street banks” described in the @GSElevator tweets. After nine years starring in one of the most successful sci-fi television series of all time, it’s fitting that The X Files actress Gillian Anderson would continue to pursue work in the world of science fiction. Anderson says she’s developed a mind for sci-fi after all those years of acting it out on the small screen. She says she wants to write science fiction novels that involve a strong female character. But don’t think Gillian Anderson is giving up on acting yet. Her new NBC series Crisis debuts in March. She also stars in a series called The Fall and will appear in a few episodes of NBC’s Hannibal this season. More information about the new Simon451 imprint is expected to come out at New York Comic-Con in October.